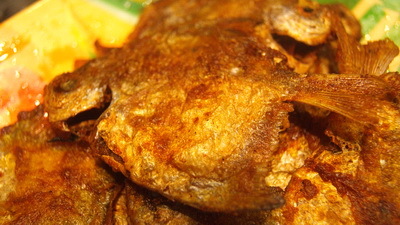 Crispy Pomfret Fry / Crispy Butter Bream Fry / Mochmoche Rupchanda is a tasty starter. Usually this recipe is made with Ticto barb(Puti mach) in Bangladesh. If you want, you can buy Ticto barb(Puti mach) from Bangladeshi grocery and try this recipe. Personally I don’t like frozen fish or try to avoid it(though it is impossible to avoid Hilsa). Actually you can make this recipe with any small fish. This recipe gives such a crisp that you will able to have whole fish with bone. Because of edible bone this recipe is good source of Calcium. 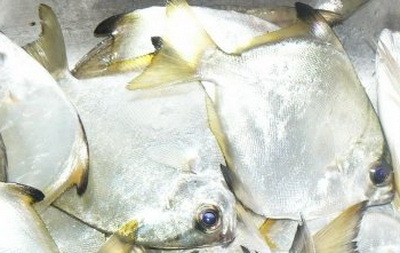 Even those kids who are not fond of fish with bones, will love this fish. 1. Clean the fish and wash it. 2. Pat dry the fish. We don’t want any excess water. 3. Mix all ingredients with fish and let it marinate at least 10 minutes. 4. Heat pan with oil on medium temperature and when oil is ready, fry the fish till it becomes crisp and golden brown. 5. Serve hot Crispy Pomfret Fry / Crispy Butter Bream Fry / Mochmoche Rupchanda as a starter and enjoy the flavour of fish.